Solid color backs with hot stamp design. There are 9 colors available for the backs and 23 standard hot stamp colors. Card size: 2 1/4" X 3 1/2". Maximum imprint area: 1 3/4" X 2 9/16". Add a $25.00 set-up charge per color. $19.00 set-up on reorders. Add $1.15 to these prices for a 2nd hot stamp color. Packaged in tuck boxes with cello windows. Lead time: 7 business days after proof approval. 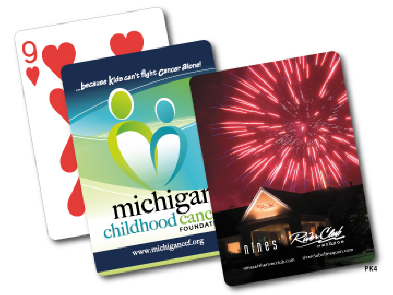 Your custom design in four color process or PMS match spot colors. Add $50.00 per color set-up charge. $35.00 on reorders. The card faces can also be customized. Overrun/underrun: 10%. For four color process the set-up charge is $75.00. $45.00 on reorders. Lead time is 10 business days after proof approval. These are "poker size" at 2 1/2" X 3 1/2". The maximum imprint area is 2 1/8" X 3 1/8". Add a set-up charge of $20.00 per color. The minimum order is 10 decks at $11.35 per deck. 25 decks at $9.45 per deck. 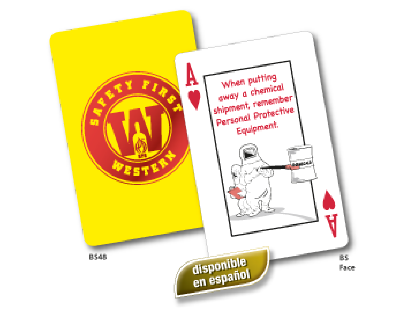 50 decks at $8.40 per deck. 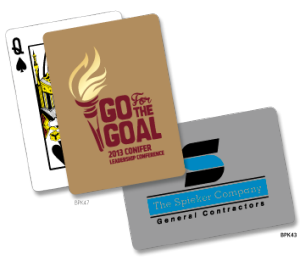 Energize your safety program with clever safety tips on each card face. Available back colors: royal blue, white, black, red, yellow, green. $25.00 set-up charge. $19.00 on reorders. card size: 2 1/4" X 3 1/2". Maximum imprint area: 1 3/4" X 2 9/16" for one color. 1 3/8" X 2 3/8" for two colors. 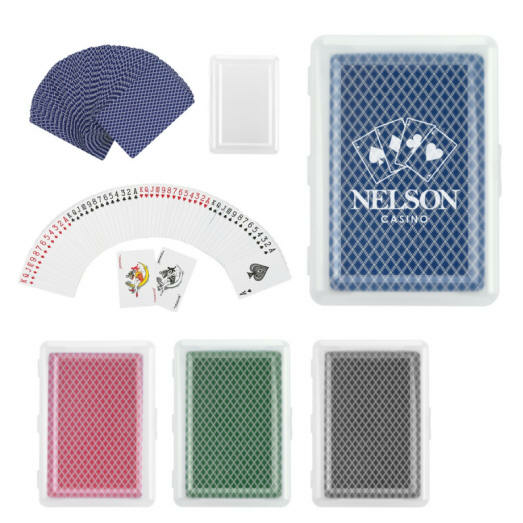 Red, blue, green or black playing cards in reusable plastic carrying case. 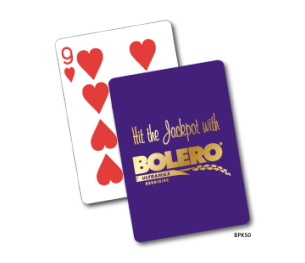 Approximate size: 2.5" X 3.5" (poker size). Backs: red, blue, green or black. Imprint area: 1.25" X 2.25" (on frosted clear case). Set-up charge: $40.00 per color. $25.00 on exact repeat orders. Add 25 cents for second color imprint. Cards are paper (not plastic).